You can’t get away from it. In every newspaper, blog, or TV news broadcast, it’s the same story, in the scariest tone — the real estate market is falling. It’s a manufactured narrative — the data tells a different story. The scary headlines, the voices of doom, are there to stoke fear and get you to read, click, or watch. That’s how they sell ads, by appealing to what scares you. And any homeowner, whether you’re actively selling or not, has a big investment in their home value. The sky’s not falling. The Seattle real estate market has changed since the most recent height of insanity last spring, but it’s still on the positive side of what analysts say is a neutral market. In fact, the vast majority of real estate analysts predict transactions — home sales — in 2019 will equal those of 2017, which was an extremely good year. • Forty-four days on market. 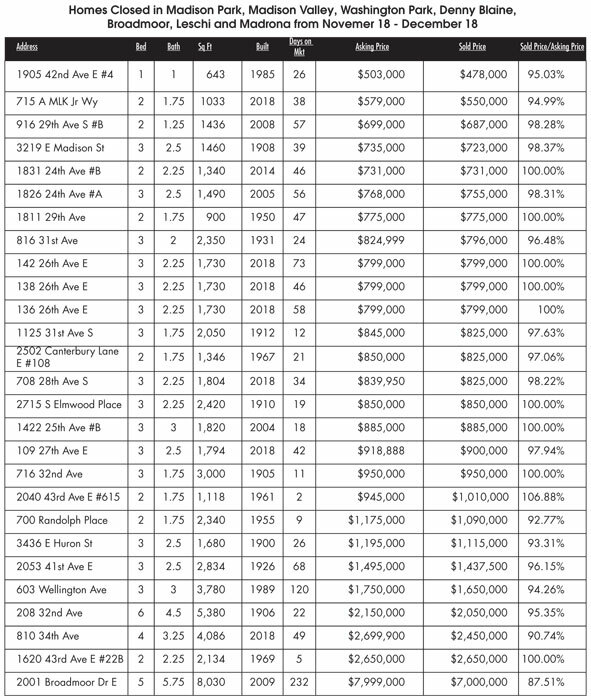 • Sales price was $1.275 million. • List to sell percentage was 97 percent. Here in Madison Park, a new listing went on the market December 15. Within 24 hours, 40 business cards were collected from 40 agents who showed the home, five pre-offer inspections were scheduled. It received six offers, with price escalations and all contingencies waived. That’s a really unusual situation at the end of the year. The sellers priced the home to sell right now — not last spring, and it did. There is more inventory, and sellers are actively prepping their homes to sell in spring 2019. Buyers are coming back from off the bench, drawn by the increase in available homes. While prices have moderated, buyers will still see some sticker shock. We’re in a market correction right now, but it’s a normal cycle. The disastrous crash of 2008 was caused by the real estate crisis, which was driven by horrible decisions, dirty loans and plainly illegal behavior. It wasn’t a normal fluctuation. This market seems to be trending that way — and in the last six normal market corrections, home values actually saw slight increases, just not as quickly as in the hot markets that preceded the transitions. If you’re looking to buy or sell in 2019, you need a broker who understands this. I just went to a listing appointment at a home in arguably the most sought-after zip code in the country. The sellers had previously listed with a discount self-serve brokerage, and their home sat on the market for 120 days without selling. This time, they did their homework, and brought in five high-producing brokers in the area to interview. As we talked, they asked me how many home transactions I had in the last 12 months. I told them the number; just about 70. It’s a good question, and almost the right question they should ask, I said. What they should care about, and what anyone who’s planning on buying or selling in 2019 should care about, is how many transactions a broker completed in a transitional or what the data would call a buyers’ market. Those are the brokers who can use their experience and connections they gained in those transitional times to get you the results you want. Deep diving into the numbers my team had in transitioning markets helped separate me from that of my competition. I was extremely honored to have signed the listing on the spot. At the end of the day, we know those headlines. There are more active homes and some neighborhoods are seeing price reductions. Tell me something I don’t know. That said, no one is explaining what that means. If I am a buyer or seller, all I care about is what does that mean for me? That’s where aligning yourself with a trusted real estate expert comes into play, even if it’s just to settle your nerves. Our role is to cool your jets and properly and calmly help interpret the data, so you can make an informed decision. In 2019, buyers will have more options as prices moderate and more homes for sale come on the market. Options create action, and buyers will come off the bench. More inventory will also lead to more sellers coming into the market — the ones who wanted to sell last year, but couldn’t find a place to move to. Sellers, however, do have to be careful to price for where we are now, and find a broker who knows what a transitional market is, and what it takes to succeed in it. If you do that, it will be a very happy new year. 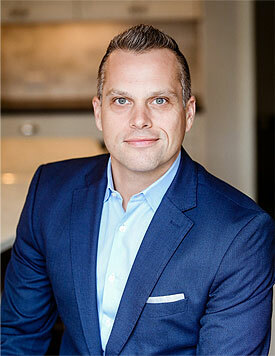 Chris Sudore is a Madison Park resident and managing broker at Coldwell Banker Bain | Global Luxury. Reach him at Chris@KingCountyEstates.com.